who lived in the Shard End area of Birmingham. 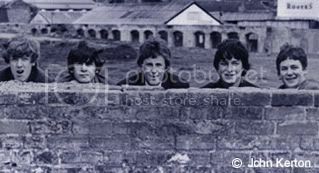 The guitarists David Watson and Jeffrey Lynne both lived on Shard End Crescent. and lived with his parents in a council house at 368 Shard End Crescent. and was so impressed, that joining a band became his main ambition. Chuck Berry, The Shadows and later of course, The Beatles. as well as making recordings and experimenting using an old tape recorder. This early experience in home recording would prove valuable later in his career. Jeff, Rob and Dave first got together playing Spanish guitars before purchasing cheap electric instruments. What the line-up lacked in financial resources, they certainly made up for in enthusiasm. which resulted in his idea to re-name the group “The Handicaps”. This was wisely amended to “The Andicaps” and so avoid offending those with a physical disability. for which the band was paid the sum of five pounds.
. At this time, the band performed only instrumental numbers by groups such as The Shadows. and in any case, the band could not afford their own PA system. Dave Walsh remembers; “The Harlequin Pub was roughly halfway between my house and Jeff’s. The Modernaires were the resident band and many other groups also played there on Tuesday nights. outside immediately adjacent to the bandstand and were able to get a good listen. It also afforded the opportunity to talk to the bands when they loaded and unloaded their gear into the pub. over the subtleties and completely effortless relaxed style of Tony Finnister’s playing”. It was during his time with the Andicaps that Jeff Lynne first started to write songs. Andicapped but even at this early stage, Jeff showed an interest in classical compositions. probably the same as The Cougars record that reached the charts in 1963.
played on the radio at the time. 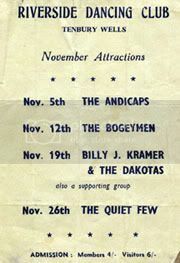 so many of their songs were incorporated into the Andicaps’ shows. A lead singer was now considered an essential part of the band so John Kerton was enlisted as vocalist. at the Regal Cinema in Handsworth where they played sets in between the Saturday matinee shows. after leaving school to find “real” jobs. Dave Walsh left the Andicaps in 1964.
who had a hit record in 1966 with the classically-styled Tchaikovsky One. for a short time as harmonica player which gave the band a more blues-based sound. as replacement for their departing lead guitarist Mick Adkins. “In Germany we watched England win the World Cup before we went on stage. Lucky for us we did not get beaten up!”. The Andicaps also visited Lapland in 1966 becoming only the second British group to perform there. and performers who were big at the time. John Kerton left the group in 1967. By this time, the pop music scene was undergoing some radical changes. Bass guitarist Dave Merrick left the Andicaps and was replaced by Malcolm Garner. Jake Commander also went and was replaced by Mike Heard from the John Bull Breed. Dave Watson left music to become a successful commercial artist and advertising director. was produced by his former Andicaps bandmate Jake Commander. under supervision of former Andicaps leader Jeff Lynne. Malcolm Garner joined the Jasper Stubbs Gloryland Band and later joined The Exception. went to live in the USA where he now works as an airline pilot. at the Birmingham Locarno for eight years. He then went on to become band-leader on the luxury ocean liner Q.E.2. 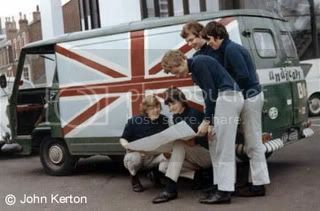 These days, John is Director of his own company JLP Events in the U.K.
who became the psychedelically-styled Idle Race in 1967.
they became one of the most successful British bands of the 1970s. My brother, Bryan, was married to Kevin’s sister, Barbara. Peter, Kevin’s brother, and myself were friends in childhood and I have very fond memories of Kevin. The last time we met up was just after I left the Royal Navy around 1975. Kevin was a truly lovely person. As kids his obsession was to be a musician and I’m pleased he followed his dream. But knowing he’s not with us now fills me with real sadness. My thoughts, belated, are with his family. [email protected] brother, Bryan, was married to Kevin’s sister, Barbara. Peter, Kevin’s brother, and myself were friends in childhood and I have very fond memories of Kevin. My brother always jokes about his only two claims to fame which were that he taught Jeff and Lynne and myself to ride our bikes! Whether it’s true is probably debatable. But I also know he held Kevin in the highest regard. The last time Kevin and myself met up was just after I left the Royal Navy, around 1975. I’ve thought of Kevin most days in the last thirty odd years, and I always remember his ambitions to make it to the top in music. S house in shard end cresentton , he was very quiet, we would all be messing around and playing up , but he was 3 years older than us ! !